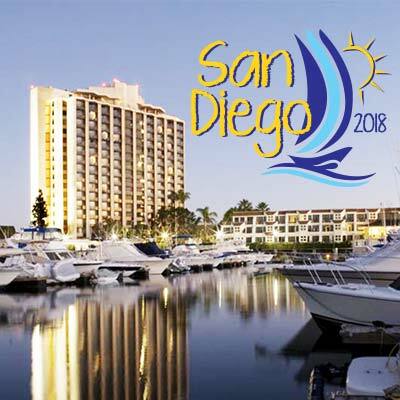 San Diego, CA – March 17, 2018– Particles Plus was a proud Platinum Sponsor for the Annual Environmental Information Association (EIA) National Conference and Exhibition, held at the Hyatt Regency Mission Bay. The team attended in support of the association and its members, building new friendships, sharing technical knowledge, and developing new business. Particles Plus was able to share its application knowledge of their brand of air quality monitors and handheld particle counters, vital for indoor air quality investigation and remediation. The model 7302-AQM air quality monitor was well received, with a focus on its combined particle matter, CO2, TVOC, temperature, and humidity detection. The team shared in many discussions on the practical application of particulate monitoring for investigations, as well as pre and post remediation clearance. The Particles Plus model 8306 handheld particle counter garnered accolades due to its ease of use and IAQ application specific features. The attendees especially valued the ability of the instruments to audibly and visually detect and pinpoint particulate sources with its Real-Time Meter function. “Particles Plus’ sponsorship and involvement with the association is greatly appreciated, and we are proud to announce their continued Platinum level sponsorship for the 2019 National Conference being held in Miami next March,” noted the Association’s Managing Director, Brent Kynoch. Particles Plus has been active in supporting the EIA and its goal of improving indoor air quality, and will continue to work with the Association developing new and useful techniques for their testing and monitoring instrumentation. For more information on Particles Plus particle counters and air monitoring instruments and their applications, or technical questions, product specifications or pricing, contact Particles Plus today.